I was wondering if there was a way to download all of the data for an ISP. 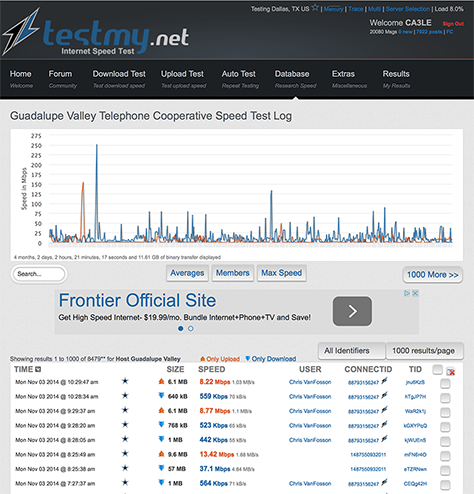 My particular ISP is GVTC (Guadalupe Valley Tele Comm). I'd like to make an argument that my speeds are not at the level I pay for. But, to make the best argument, I need access to all 8400+ data points. Is this possible? You can see all of the results right in your browser. Change the results/page to get a wider angle. I hope this helps. Thanks for using my site! I appreciate your quick response. I'd already checked the results page and broadened the data to 1000 responses. Unfortunately, I wasn't able to download the data (I want to put into an Excel and run some statistical testing to demonstrate the variability that GVTC doesn't seem to understand). Is there an export link or something that I'm missing? Cut and pasting didn't work for me. I usually only let people export their own data. But I see no problem exporting that one ISP for you. I just don't want people to have a way to extract all of my data. I need to take a minute to give the export program the ability to do that... I'll then email you the output. -- same CSV format as the "export" for your own stats. Give me a little time, I have some things to take care of first. Thanks for your patience..... and persistence. Here you go. Data going back to Jan 2012 for Guadalupe Valley Telephone Cooperative. I think I might make it so that you're able to download those tables right on the site. I could at least give users access to download their own host and location tables. Look for that in the future. I hope this helps your cause. Help me in return by spreading the word about what I do here. I'll definitely spread the word about your site. Thanks for your help. With your data, I was able to demonstrate to the GVTC crew that my service was definitely faulty. All of the sudden today, I've got 30+ Mbps running at the house. Wow, that's great news! I'm happy that I was able to help you. That's for following up, I always love hearing feedback like this. Woot! I love helping people. If you'd like similar information don't hesitate to contact me. I hope all is well. I am an analyst with a research firm based out of Fort Worth, TX and am currently covering satellite carriers. I was told your company had records dating back to 2012, but I can only get data as far back as August of this year. Is there any way I could receive download speed data for ViaSat and WildBlue as far back as your records go? We would be willing to pay/donate for this service. Thanks for your help and I look forward to hearing from you soon. You're in luck... I don't want your money. What I'm after can't be purchased, I do this for more than money. If you publish the data, in any form, please cite TestMy.net as your source. Send me a link too, I like to read stuff like that. Here's the tests taken by ViaSat and Wildblue customers back to May 2012 in raw CSV format. I have a lot more coming... querying the stats prior to 2012. I need to step out for a little bit. I'll send you another file in a little bit. Here's more that I found. I used to store the hosts by domain name. Some providers would have multiple domain names... if you know what they were I can look them up. It's much easier the way I store it now. viasat.com only pulled up a few hundred results. Can you think of a different domain name that their users would have been detected as? Also, any other domain names either may have been detected as. If you have more I can aggregate the data for you. Been a week and he hasn't downloaded the files. Oh well, I tried to help.